On display, from November 17, 2015 to January 4, 2016, at the Bentley Library is an interdisciplinary collection of books highlighting research about data. Included are popular and scholarly works about collecting it, obtaining it, analyzing it, evaluating it and finally accounting for it. Visit the library and browse through the physical display located in front of The McGladrey Art Gallery or view the contents of the display online. If you see something online you would like, just request it through the library catalog, and you will be notified when the item is available on the hold shelf for you. Many of the titles in this collection are also available electronically through Books 24×7.com and Overdrive Downloadable Books. 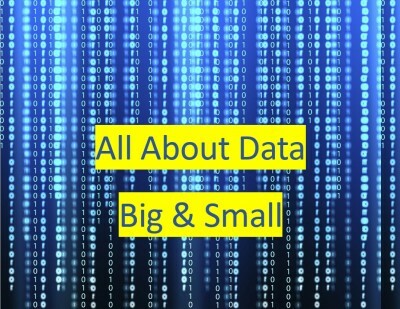 Big Data, Little Data, No Data: Scholarship in the Networked World by Christine L. Borgman. Bursting the Big Data Bubble: The Case for Intuition-Based Decision Making edited by Jay Liebowitz. Handbook of Digital Currency: Bitcoin, Innovation, Financial Instruments, and Big Data edited by David Lee Kuo Chuen. Big Data : A Revolution That Will Transform How We Live, Work, and Think by Viktor Mayer-Schönberger and Kenneth Cukier. Dataclysm : Our Life in Numbers by Christian Rudder. The Organized Mind : Thinking Straight in the Age of Information Overload by Daniel J. Levintin. We hope that you enjoy this display. If you notice we are missing a title on this topic, please feel free to suggest a purchase. At the Bentley Library, we offer a lot of resources for study and coursework, but we also think that there’s a place for recreational reading in an academic library. You think so too, judging from checkout rates of our Popular Reading and audiobook collections. Last year, we debuted OverDrive Downloadable Books, a collection of fiction and nonfiction electronic books and audiobooks for users who use mobile devices and computers. Initially, searching and browsing these books was limited to the website from which they are downloaded. Now, our entire OverDrive collection of e-books and e-audiobooks (currently 347 e-books and 237 e-audiobooks, but growing all the time!) is also searchable in both versions of our library catalog! We’ve made searching for and downloading these titles easy, whether you enter a search by using the single search box on our homepage or by using the Classic Catalog link under that box. Once a search is entered, the search result display clearly indicates whether the title is an e-book or an e-audiobook. The records feature a direct link (via a Bentley login page) to the item in OverDrive Downloadable Books. Most records also contain a link to an excerpt of the e-book/e-audiobook, allowing for “test driving” before starting the checkout process. In the single search box display, you can access those links from the search results page, as below, or from the individual e-book/e-audiobook page that displays when you click on the title link. The Age of Innocence is available to download as an e-book or an e-audiobook via OverDrive. In the Classic catalog, only the direct link to the e-book/e-audiobook, titled Access this Resource, appears on the search page, as below; both the search and the excerpt links appear on the individual e-book/e-audiobook page that displays when you click on the title link. The e-book version of The Age of Innocence as it appears in our classic catalog. If you would prefer to use the catalog to browse the collection, you can easily see a list of the entire OverDrive collection in either catalog version. Using the single search box, type “overdrive” in the box, then on the left side of the page, click “OverDrive” under the Location heading. Or, in the Classic catalog, click the Advanced Search link. Choose “OverDrive” as the location, and type an asterisk (*) in the first search box. If you’d prefer to continue searching/browsing directly at the OverDrive web page, links to OverDrive Downloadable Books are still available on the Library’s home page in the Quick Links section, the Research dropdown menu under Search >> ebooks, and the Databases A-Z list. We are really excited to help you add to your reading list via the library catalog. If there is something you’d like to see added to the collection, let us know by clicking the Suggest a Purchase link on our home page. Happy reading and listening! Historically, databases of electronic books have often been limited to on-screen viewing and limited printing. Now, with easier availability to affordable personal devices that allow you to read on the go, downloadable books have gained in popularity. 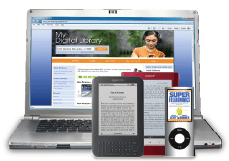 The Bentley Library provides both types of ebook databases. Whether you are downloading the latest fiction and nonfiction to take to the beach, studying for licensing or other examinations, or researching and writing a paper, we have a database for that! What’s included? Over 500 eBooks and audiobooks with an emphasis on classic and popular fiction and nonfiction, but including some research materials. New materials are added on an ongoing basis; suggestions for new materials are welcomed at our Suggest a Purchase page. Is it downloadable? Every book and audiobook in this collection may be downloaded to some combination of computers, tablets, e-readers, smartphones, mp3 players and iPods. Available formats include Kindle, ePub, and PDF for ebooks, and mp3 and WMA for audiobooks. Not all formats are available for all titles. How does it work? Browse by category, or search the database by keyword, title, author/creator, subject, and more. Then, follow the download instructions provided on the title’s information page. How to gain access? Direct access is via Overdrive Downloadable Books. A Bentley username and password is required to use the database both on- and off-campus. In addition, depending on your desired format and device, you may need to download additional software. More information is available in the Getting Started area on the Overdrive home page. What’s included? Books on business, finance, information technology, health and wellness, and productivity. Also included: study guides for exams such as the CFA, and software manuals for business and statistics applications such as SAS and SPSS. Is it downloadable? Books in this database are presented in electronic format, but must be read on a computer screen. How does it work? This database is searchable by title, author, keyword, publisher and more, and browsable by broad topic areas such as Business, Finance, IT/Technical and Well-Being. Clicking on a title displays a linked Table of Contents, from which you can navigate the book’s content. If you conducted a keyword search, your search terms appear in the Top Section Hits area. How to gain access? Direct access is via Books24x7.com (Business & IT Books). A Bentley username and password is required to use the database both on- and off-campus. What’s included? Nearly 8000 electronic books are included in this general-interest collection. Both scholarly and popular titles are available. Is it downloadable? The full PDF text of all books in this database may be viewed on-screen. Printing and/or emailing documents is possible, but is limited. How does it work? Using the EBSCO search interface, browse by category, or search the database by keyword, title, author, subject, and more. Click the link titled eBook Full Text to view the content, then navigate using the linked Table of Contents, or jump to desired sections using the search box. How to gain access? Direct access is via EBSCO eBooks. A Bentley username and password is required to use the database off-campus. Is it downloadable? Books in this database are presented in electronic format, and can be read on the computer screen in HTML or in the Safari Books Viewer. Books can be printed two ways: by chapter in HTML format, or by page in the Safari Books Viewer format. Users may also email a link to the book for later viewing. How does it work? Search this database by author, subject, or software vendor, or browse by category or software vendor. Once you’ve chosen a book, you can search within the book, or read it via the links provided in the Table of Contents. How to gain access? Direct access is via Safari Books – Tech Books Database. Off-campus, a Bentley username and password is required to use the database. In addition to the direct links above, all of these databases may be found at the Databases A-Z page on the Library’s website. If you would like assistance with searching and/or downloading material, please contact us. Happy reading and researching! Database of the Month provides a very brief introduction to an important research database, highlighting key features of the database that you should know about. If you would like more information about this database (or any of the library’s databases) please contact the Reference Desk. If you would like a demonstration of this database for a class, please contact our Coordinator of User Education, Elizabeth Galoozis. All current students, faculty and staff are invited to stop by to learn more about downloadable books. If you bring your laptop and/or mobile device we will be able assist you with searching and downloading. Desserts and coffee will be provided! Can’t wait to get started? Read more about this new service in the blog post below. Or, go directly to the library’s downloadable books site, powered by OverDrive, at http://ezp.bentley.edu/OverDrive/bentleyu.